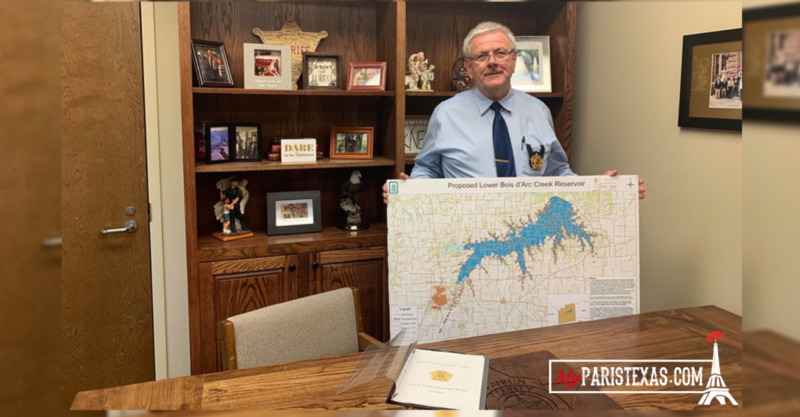 The Fannin County Sheriff’s Office is set to receive a $2.5 million grant over 10-years to fund a marine/patrol unit, including training and equipment, for Bois d’Arc Lake. “I am thankful for the additional deputies that NTMWD (North Texas Municipal Water District) agreed to provide as well as the specialized equipment and training opportunities that will be available for our deputies,” said Fannin County Sheriff Mark Johnson. The grant will pay for four deputy positions, a patrol vehicle, two boats, and an ATV. The contract also includes funding for a state-of-the-art underwater sonar device that will be towed behind a larger boat with capabilities to find bodies and evidence under the water up to a depth of 300 feet. Funding for training on the use of this device is also included in the contract. in addition to more manpower, equipment, and training, the county will also upgrade their radio communication system which will provide radio coverage in areas determined as lacking. “I am especially excited about the new communication system that will benefit several agencies throughout Fannin County,” he said. “One of the largest needs we discussed is the radio communications and the lack of reliable and consistent service in the area where Bois d’Arc Lake is being constructed,” explained Johnson. While Johnson says he isn’t a person who spends much time on the water, he does hope the new lake is successful and will bring the revenue to the county that is expected. Construction is underway on the 16,000-acre lake which is expected to be completed in 2022.